In the work of tai chi chuan there are certain key aspects or qualities that should be trained to allow a fuller understanding of how the art works, both as a health exercise and more essentially, as an effective martial art. The starting point for learning tai chi chuan is the Hand Form, the series of carefully choreographed movements which have their origins in the original 13 postures, reputedly created by Chang San Feng in Wudang Mountain nearly 500 years ago. The tai chi Hand Form consists of a series of postures, linked together in a smooth, flowing manner. These sequences, whatever the style (Chen, Yang, Wu, Sun and Li being the main styles), train the body and mind to be rooted, relaxed, centred, focused and flexible. Tai chi Push Hands (Tui Shou) is a partner exercise which is considered to be a training exercise that is a bridge between the Hand Form and free-fighting (San Shou). 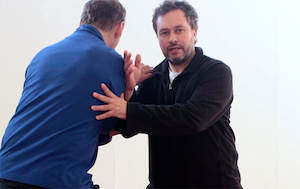 The basic elements of Push Hands is connecting, through hands and arms, to your partner in a soft, gentle manner to train listening energy (Ting Jing), sensitivity, awareness, grounding whilst retraining the body’s natural reflexes to relax and flow with oncoming energy, rather than stiffening up, resisting or repel the attack. Whilst Push Hands ultimate requires spontaneity much can be gained by training the key aspects in a structured, systematic manner to fully comprehend the effective techniques of the art. The key aspects are the Eight Gates (Bamen) or Principles. Peng, Lui, Ji, An, Tsai, Lieh, Chou, and Kao. Peng is an expanding opening quality, likened to a filling balloon. Rather than exercising raw physical strength Peng trains a connection from the ground, through the body with the mental intend of opening and expanding through the arms ultimately uprooting the opponent. Lui is a yielding absorbing quality where one is connecting to the opponent’s oncoming force, and moving in the direction of the force whilst ‘sticking’ or ‘adhering’ and ultimately leading that force into the ‘void’ or emptiness. Ji is a pressing quality somewhat like that of squeezing into the centre of a sponge. The palm of one hand is connected to the inside of the wrist of the other hand whilst being connected to the opponent, ultimately connecting to their ‘centre’ and disturbing their equilibrium. An is a pushing quality which is executed by placing the palms on the body of the opponent and connecting to the ground, through the feet, pushing from the feet, into the palms and uprooting the opponent. Tsai is a plucking quality similar to pulling a plant from the ground. When pressing or pushing the opponent towards the ground there comes a point where they will respond to the downward force by trying to rise upwards, this is the point when one would connect to that upcoming force and ‘pluck’ the opponent upwards and off their feet. Lieh is an opening, splitting movement which separates the parts of the opponent’s body in two directions such as can be seen in movements like ‘Diagonal Flying’ where one would place their leg behind the opponent’s whilst connecting their arm across their chest and turning from the centre causing the opponent to fall backwards with the opposing forces being applied to the upper and lower parts of their body. Chou is ‘Elbow Stroke’ where the opponent is struck with the elbow, which is light and free, with the impulse of the force coming from the centre or waist and propelled by ground force from the feet. Kao or ‘Shoulder Stroke’ is when one’s shoulder is connected to the opponent’s body and the impulse of the force again comes from the ground, through the feet, through the body, propelling the connection through the shoulder forward, into the opponent’s centre. We have created two video clips to illustrate the Eight Gates. In them Nikolaus Deistler from Austria explains the principles of these techniques and, with the help of Ronnie Robinson, demonstrates the martial applications whilst also providing a series of simple partner exercises to train the various aspects of these Eight Gates. This video was taking at the International Push Hands Meeting in Hannover, Germany. Subscribe to our YouTube channel to receive updates on when other films are posted.